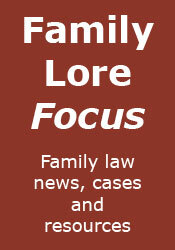 Family Lore: Collaborative Law: An Oxymoron? "Collaborative law has certainly not taken hold here in the Fifth and Thirteenth Judicial Districts. Perhaps this is because couples who are facing a divorce are not likely to hire lawyers who are more akin to mental health therapists and advocate that everyone get naked, jump in a pile, eat potluck and sign agreements mutually beneficial to everyone." "Perhaps I am old fashioned but I see collaborative law as an oxymoron. Lawyers are trained to do battle for their clients. Certainly, we learn the art of negotiation and seek settlements that are to the benefit of our client (and the children who are the subject of a custody dispute) but collaboration and law simply don't fit together. You might feel really good about it but I don't see how you can be sure you did the right thing." Somehow, I can't see a family lawyer over here expressing such views, and this wonderful plain-speaking that seems so typically American initially seemed amusing to my 'sophisticated' English tastes. However, putting aside the blunt rhetoric, do they have a point? We do have an adversarial system over here, and everyone is entitled to their day in court, if they want it. As the writer of the article points out: "If the couple is fair minded, we don't need collaborative law to reach settlement .... If they are not fair minded, it is my opinion they are more likely to reach settlement if they have a court date and a lawyer who is prepared to try their case." I don't agree with the article - especially the 'I don't see how you can be sure you did the right thing' - it seems to me that the same argument could be put about going to court, certainly if you are judging outcomes on anything other than a 'he who dies with the most toys wins' basis. I think the idea that if the parties are fair-minded they don’t need the Collaborative process is an over simplification, too – of course there are some couples who are able to agree on the terms of their separation with little or no outside intervention, and in those cases they don’t really need either us or the court except to formalize their own agreement, but in my experience there are an awful lot of couples who do need a process. I don't feel that Collaborative Law is incompatible with the ‘standard’ legal process – like mediation, it is voluntary, so it doesn’t remove the entitlement to have the day in court for those who want it. It isn’t suitable for every case – there does need to be that degree of willingness and desire to be fair minded by both parties but my experience (and in the interests of openness I should say I am a Collaborative Lawyer and deal with cases both on a collaborative basis and using more traditional methods) is that it is much more likely to end up with something which both parties are happy with. Often the end result is not very different in terms of any % split of assets to what might result from what a Judge would decide, but instead of ending up with a client who feels that their ex. has ‘won’ or has ‘got away with it’, you tend to end up with a client who feel that even if the outcome isn’t precisely what they would, ideally, have wanted, it is fair. It is usually much less corrosive - and while you can’t put a financial value on that, I think it is very valuable to clients, and where they are involved) to children. I’m not sure that ‘lawyers are trained to do battle for their clients’ is a very good fit with the philosophy espoused by Resolution et.al., either! Thanks, Marjorie for that illuminating contribution. I never practised collaborative law, but I suspect that you may be right about the parties' perception of collaborative outcomes, as against court-imposed outcomes. I had the same thought about the 'trained to do battle' comment! As to your last paragraph, a good theist will always pick and choose which parts of their religion they want to follow! It certainly doesn't sound very 'Christian' to me. Children disputes are complicated enough without bringing in religion. My understanding of collaborative law is that it can be very successful in achieving agreements and in keeping hostility to a minimum. A settlement reached through cooperation should be much stronger and more long lasting than one imposed by a judge. The merits of having your 'day in court' are severely over-rated: it is rarely a single day, and insisting on it has little to do with the best interests of the child. Isn't it time that legal aid was made available for collaborative law? I agree with you about collaborative settlements, as I indicated in my last comment. I also agree that legal aid should be available. I'm always a little confused when those in the legal profession have such a strong reaction to collaborative law. I'm not sure that the opinions of attorneys who make their living "stirring the pot" with litigation are the most credible in evaluating the efficacy and benefits of various alternative dispute resolution options. First, the “scorched earth advocacy” perspective as it relates to family law demonstrates a simplification and narrow view of the divorce process, the client needs in that process and the ability for the client to achieve a satisfactory result through that process. Clients going through a divorce are generally conflicted in their goals and how to achieve those goals. They are also aware that the impact of their choices will affect more than just themselves. Resources available to these clients, whether time, emotional management or financial resources are also strained and limited. Most importantly, these clients are in the midst of a life upheaval that represents an enormous amount of risk to be evaluated and managed. It is entirely reasonable that even parties who dislike each other intensely, are not able to work together and need significant professional assistance to achieve their goals, would decline to take on the additional risk, expense, time and emotional angst and potential damage to their children that litigation represents. Ultimately, if litigation were able to provide a process that meet the needs of the client, could guarantee a reasonable certainty to obtain their desired result and was available within the resources of the client ...then there would be no market interest in alternatives such as mediation or collaborative law. At the end of the day, we attorneys can "think" anything we want about the various alternatives to litigation. The legal consumers are the ones who decide which option is best for them, which alternatives are efficient, effective and within their resources. I personally aspire to provide my clients with the legal services they desire without patronizing their ability to make an informed choice for themselves. I started practicing family law right when mediation was starting to take roots and there was certainly some resistance to that concept. Now, at least where I practice (Jacksonville, Florida), the thought of going to a contested final hearing without first attending mediation would be very rare. My best guess is that in the next several years more divorcing couples will find that collaborative divorce is a viable option, but I also believe that it will take some time for the concept to get traction in the marketplace. Thanks for that. I agree with your thoughts regarding the future of collaborative law. Collaborative Law or Collaborative Practice may not have taken hold in the vicinity of Rice Law but it has in the Roman City of Bath, UK. With almost every specialist family solicitor in the city trained in the practice, it is a process option that is frequently drawn by them to the attention of and adopted by couples facing separation and divorce. • Recognises that the end of a personal relationship isn’t just a legal change for a couple but impacts their children, their financial resources and their emotional feelings. By being able to involve other suitably qualified professionals like child specialists, financial planners and divorce coaches who can provide neutral expert advice and guidance on these, collaborative lawyers can continue to concentrate on being legal advisors and representatives of their clients, managers of the process, educators of the couple, facilitators of the discussions on the issues and options, and negotiators of the settlement without becoming “akin to mental health therapists” nor advocating “that everyone get naked, jump in a pile, eat potluck and sign agreements mutually beneficial to everyone." Seriously, thanks for that contribution, Richard. More pre-nups: An important development? Marriage is a joint venture... ? Who would be a social worker?